This shop has been compensated by Collective Bias, Inc. and its advertiser. All opinions are mine alone. #RibsAndABigYellowCup #CollectiveBias . To be completely honest with you all, I do not like to cook 7 days a week! Our family likes to take at least 1-2 nights out of the week to have a “Family date night” enjoying a delicious meal. I am talking about a non-fast food family meal. It’s a good time for us to chit-chat in a different environment while filling up our tummies with delicious food. Speaking of filling up our tummies we discovered Dickey’s Barbecue Pit is having All You Can Eat Ribs for just $19.99 now until 10/28/18! So why wouldn’t we head over there and who doesn’t love ribs!? The All You Can Eat Ribs for $19.99 is an in-store promotion only at participating stores only. This includes 4 ribs, 2 sides of your choice (they had a lot to choose from) and a buttery roll. 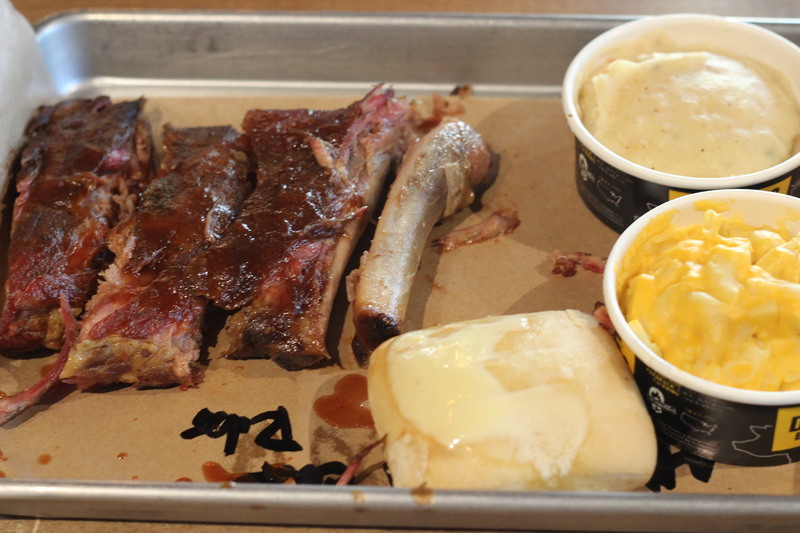 Additional ribs are provided in quantities of 2 along with refills, sides and rolls. This is of course Dine-in only. Not valid with any other promotion or discounts. You know a Dickey’s meal would not be complete without Coca- Cola in their Big Yellow Cups! In case you were wondering what my sides were I got the baked potato casserole and good ol’ Mac and Cheese. Yum. My husband and our daughter Jayde were racing who could eat the most ribs. Can you guess who won? Haha, they were just so good! Their tender ribs are slow-smoked and feature Dickey’s famous Rib Rub and Sweet barbecue sauce. Also, Dickey’s Barbecue Pit Ribs are pit-smoked on-site daily. You really have to head out to a Dickey’s near you for this limited time special and to get your hands on the Big Yellow Cups! Once you find your location go ahead and give them a call and ask if they’re doing this amazing promotion before heading in. Oh and you can’t leave without that complimentary ice cream. *wink wink* Cheers to family date nights!